Eighteen-time Grammy nominee and Grammy award winner, Anthony Hamilton, invites youths to his private soundcheck and rehearsal to learn STEM and Arts through music. NATIONWIDE (BlackNews.com) — Anthony Hamilton is a popular R&B artist that has more than made a name for himself in the entertainment industry, winning several awards including the Grammys. However, the music legend has not only impacted the world through his music, but has also taken it a notch higher to mentor youths and teach them real-life lessons as he recently invited youths from different organizations to his private soundcheck and rehearsal for his sold-out concert with the aim of teaching them STEM & Arts through music (STEM/STEAM, Science Technology Engineering Arts and Math). Over the years, Anthony Hamilton has dazzled lovers of good music across the globe with hits that remain evergreen till date, selling more than 40 million copies of his different albums. As part of his way of giving back to the society, the talented act and father of 6 boys, two of whom are twins, decided to share Arts and STEM with youth in an unprecedented manner using music. Young people from the Steve & Marjorie Harvey Foundation, YMCA, and Kidz Mic were invited to a private soundcheck and rehearsal where they learned from experts in the field. Inviting kids on this adventure matters because studies show the importance of STEM to the development of society. It has also been revealed that the number of African American women in STEM occupations and opportunities is low compared to their counterparts due to several factors. Consequently, it makes Anthony Hamilton’s generosity in offering STEM and STEAM education in a fun yet impactful way a needed support to the community overall. 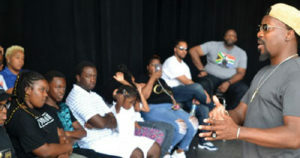 Greg Black, the Stage Manager for Anthony Hamilton taught youth about behind the scenes of concerts, sound engineering, technical connections, while the lighting director, Guy Rhodes showed participants how to measure light, mix light to make new colors and more to enhance live concerts. Courtney Taylor, who was the Front House Engineer shared the science of sound and audio engineering with youth and Lamont McClain, the talented Bass player, spoke about the bass line, rhythm, and other related topics. Kidz Mic, one of the participating organizations documented and vlogged kids’ point of view of the day so that other kids can learn from it. Kidz Mic also shared tips with Anthony Hamilton’s team on how to keep the STEM/STEAM learning fun and comfy for the other kids. Founded by an 11-year old and 9-year old sister and brother duo, Kira and Skye, Kidz Mic is a STEAM Ed. Media company that aims to help more young people excel in the arts and sciences, which led to their involvement in Anthony Hamilton’s cause. Kidz Mic founder Kira said, “We do a lot of cool things in Kidz Mic but this STEAM event with Anthony Hamilton was especially fun because we really enjoyed getting to check out STEAM and music technology up close.” They are sharing more for kids on their pages @KidzMic. Key learnings from the day are also being shared to help kids around the world by top mommy and community bloggers including BlackMomsBlog.com, KiwiTheBeauty.com, MommyTalkShow.com and many more.